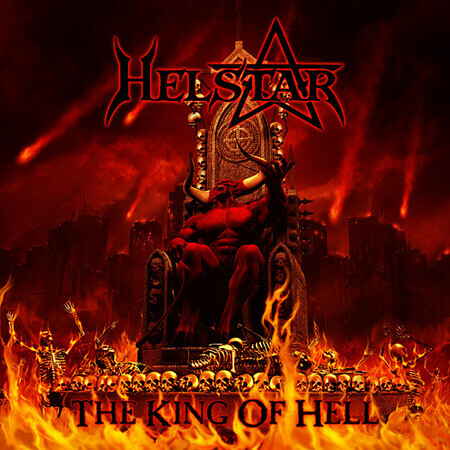 "The King of Hell", the new album from reactivated Texas heavy metal legends HELSTAR, will receive a North American release on January 13, 2009 via Locomotive Records. "The King of Hell" was released in Europe on September 26, 2008 on AFM Records. HELSTAR held an exclusive "The King of Hell" listening party for select south Texas fans on August 2 in Houston at the Jet Lounge. The band played the CD in its entirety and also rewarded attending fans with a variety of autographed memorabilia, including a distribution of the entire lyrics and credits for "The King of Hell". "Robb's MetalWorks" has posted photos of the listening party at this location. HELSTAR vocalist James Rivera was interviewed by "Whiplash", a weekly metal show on Belgian national radio Studio Brussel, hosted by AFTER ALL guitarist Dries Van Damme. Listen to the chat in streaming audio at this location. Fan-filmed video footage of HELSTAR performing the song "The King is Dead" on July 11, 2008 at the South Texas Rock Fest at the Javelina Harley-Davidson Festival grounds in San Antonio, Texas can be viewed below (clip uploaded by YouTube user "JohnEbrownTX").